Collison in two dimensions apparatus with accessories included. 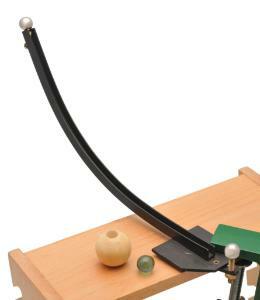 This apparatus consists of a curved track with a base at one end. On the base is a support to hold a ball at the proper height for a center to center collision with a second ball rolling down the track. The track is level so collision occurs only in the horizontal plane, simplifying calculations. Consists of 25 cm one piece track, 3 balls 12 mm diameter, 2 steel, 1 glass and 1 plumb bob.